Are you planning for a Kerala Backwaters Houseboat Trip? We are here to help you! In this blog post you’ll find all the tips and help that is required to enjoy a fun filled holiday in Kerala Backwaters and Houseboats. Kerala Backwaters & Houseboat Trip – The Complete Guide. Kerala is one of the most charming and captivating states in India and this exceptional natural beauty claims for it being named to be “God’s Own Country”. Kerala provides tourists with memorable experiences and Kerala tourism options which are going to delight your holidays with leisure and pleasure. Houseboats in Kerala is a unique attraction which has gained the attention of tourists from all over the world. One cannot think of complete tours and travel in India without exploring the scenic backwaters with a stay in a Kerala boathouse. Here is a list of questions that we get from guests who want to book a houseboat package and you may have some these questions as well if you are planning to visit Kerala. Planning any holiday can be a time consuming affair with all the myriad details that need to be taken care off. However if you do the planning properly then you can sit back and relax instead of being under stress while celebrating the houseboat holiday in Kerala. We want you to have an enjoyable time during your Kerala Houseboat trip in Alleppey, Kumarakom or Kollam and this guide will help you for the same. What is unique about Kerala Backwaters? Kerala backwaters is ideal for a visit at any time of the year but if you have a choice then plan your visit to backwaters between August and May so that you avoid monsoons and enjoy the experience of tranquil, palm fringed backwaters of Kerala to the maximum. So what is the best time to visit Kerala backwaters?. Should you visit it at the best time for Ayurveda treatments in Kerala or the peak season in Kerala ?You can take a backwater cruise irrespective of the season but Kerala has a knack of throwing up sudden bursts of showers in monsoon and if it is a heavy shower you may not enjoy as much as you would wish to. Alleppey, or Alappuzha is fondly phrased as the “Venice of the East”. Major attraction of Backwater cruise is Alappuzha Round trip which is a popular Alleppey houseboats day trip cruise. This cruise goes through Kuttanad , which is an ideal place for a house boat cruise.This core backwater area is rich in natural beauty with enchanting greenery all around the backwaters, as either side of the river edges the gentle surfing of the coconut palms. You can the mirror still images of gods own country and the tree branches bending precariously over the water before they shoot skywards is mesmerizing and a sight to be hold. Kerala houseboat rates will be the cheapest for the Alleppey backwaters round of houseboat cruise. Kumarakom is a favorite holiday destination of celebrities like former Prime Minister of India – Atal Behari Vajpayee and Britney Spears. Kumarakom is also famous for Kumarakom Bird Sanctuary on the periphery of the picturesque Vembanad Lake. It is a small but picturesque village in Kerala which is the ideal destination for eco tourism, beach tourism and backwater tourism. A houseboat cruise on the scenic Vembanad Lake provides wonderful opportunity to see the lots of bird species of Kumarakom Bird Sanctuary. Sunset cruise over the scenic Vembanad Lake is simply a delightful experience of lifetime. Houseboat Cruise on Kumarakom backwaters provides uniquely different but delightful experience. Alleppey to Kumarakom Round is a combination of cruises which combines the best of backwater cruises around Alleppey and Kumarakom and alleppey houseboats price for this trip will be around Rs.6000 in a deluxe houseboat. You can enjoy the maximum in this trip, cruises around the villages, farm fields, Resorts and Bird sanctuary and other places of interest are included. You can explore Kuttanad, the rice bowl of Kerala at Alleppey and Kumarakom in a single backwater houseboat cruise. Alumkadavu is the destination near Kollam (21 kms). The eight hour trip between Kollam and Alappuzha is the longest backwater cruise in Kerala and not many companies offer this as a part of alleppey houseboat packages. In this trip the entire backwater area is covered but the leisure time is less. Half the way will be finished on day one and the second day you will reach Kollam. The entry to house boats is restricted to some areas because there is no sufficient space for canals. This one way backwater cruise’s major attractions are paddy fields which are lower than the sea level, coir village, Kumarakodi, Karimadikuttan,, Matha Amrithamanadha Math at Vallikavu. Alleppey to thottappalley is another popular backwater route in Kerala. The major attractions in this route include Punnamada lake, Chavara Bhavan (traditional houses on the banks), Church at Champakkulam, 11th Century Buddha temple – Karumadikkuttan and Ambalappuzha temple. Kumarakom and Alleppey are popular for weekend packages in Kerala and Kerala honeymoon tours . However with in these famous backwater destinations, you can choose Best Backwaters stretches in Kerala to enjoy the best backwater experience. Houseboats in Kerala are made up of eco- friendly materials are available on hire for day cruise or for a night stay. Most of the boats are made of thatched roofs made of coconut leaves. They are outfitted with modern amenities and provide facilities of a comfortable hotel. Kerala Government gives official rating to houseboats which are Platinum or green, Gold and Silver rating. However these ratings are not mandatory and very few boat companies would have rated their houseboats with government ratings. There are four main types Kerala houseboats that may be available with most houseboat providers- Standard, Deluxe, Premium and Luxury. Standard Houseboat– This will a basic boat and sometimes may turn too basic for your liking. We would not suggest you to go for this as many of them will be boats with out an air conditioner. Deluxe/ Premium Houseboat- These are houseboats which are much more comfortable and where air conditioner will be available for 10 hours at night. These are the houseboats that are provided by us to most of our guests booking backwater tour packages. Luxury / Super deluxe Houseboat– Super deluxe houseboats will have uniformed butlers and 24 hour air conditioners and you should choose this option if you enjoy staying in the upper echelon hotels. Here is a list of the best luxury houseboats in Kerala. You should always check Kerala Houseboat Photos and search for Kerala houseboat reviews in TripAdvisor or any other travel website or should ask around with your friends if they have already taken a houseboat trip in Kerala for a good recommended tour operator who will arrange for a houseboat trip in Kerala. The houseboat with double deck has an upper deck to enjoy uninterrupted backwater view with conference facilities and a capacity to cater to more people. The upperdeck usually has a cosy double bedroom with attached bath, a living area with a TV and music system and a sundeck. The lower deck usually have 2 double rooms with ACs and attached baths, with each room capable of accommodating 2 adults and two or three children. The lower deck usually has its own dining area with television and a sitout and welcome area of the houseboat and the two decks also ensure that two separate groups can hire the boat at the same time – even as they maintain their privacy and exclusivity – at half the cost of hiring a full houseboat. There are houseboats in Kerala without a full upper deck but with a sun deck which is a great way to enjoy the backwater cruise with out any obtrusive distractions that can be there in the lower deck. These houseboats will have a staircase from the welcome area of the boat that goes into the sundeck. Sundeck can be open or glass covered. Given a choice , opt for a glass covered houseboat that will protect you from insects at night. Houseboats in Kerala are made of the parts of a coconut tree, and plow on the waters, taking you to the interior of the lakes, making your stay a thoroughly memorable affair. Most houseboats are an awe inspiring moment to realise how an entire house – including a sitting room, two bedrooms and a kitchen – have been constructed atop a boat. Houseboats of Kerala are available for rental from prices starting from Rs.5000 for a Non A/C to Rs.40000 for a super luxury houseboat with butlers. Select a single bedroom houseboat for two people and two bedroom houseboats for four people, 3 bedroom houseboat for six people and a 5 bedroom houseboat for 10 People. Kerala house boats have fully furnished single double triple and five bedrooms with sundeck, private balcony with comfortable chairs, kitchen and toilet. There will be three crew members comprising of two oarsmen and a cook . It takes great skill and meticulousness to construct and navigate these giant Houseboats by tying huge planks of Anjili tree and the staff has been trained properly. All Houseboats have adequate safety measures and Kerala government and tourism department conducts periodic audits and inspections to ensure safety of tourists. You have an option of choosing between a Day trip in Kerala Houseboat or Overnight stay in any Kerala Houseboat Package. Day Cruise starts earlier than overnight package and cruise time is still 5:00 PM in evening and you can always choose this option if you have an early morning flight or you are travelling with senior citizens or kids who may find it difficult to stay in a houseboat at Night. Starting point of a Kerala Houseboat Cruise is Alleppey / Kumarakom for both Day Cruise or Overnight Stay and Kerala Houseboat booking has to be done from either of these places . While many Kerala Houseboat Cruises take tourists from a particular point and bring them back to around the same point next morning there are some specific cruises mostly in the Alappuzha area, such as the one night cruise from Alappuzha to Thotapally via Punnamada Lake,two nights cruise from Alappuzha to Alumkavadi,one night cruise from Alappuzha to Kidangara,and one night cruise from Alappuzha to Mankotta.There are numerous such cruises which we arrange for our guests on special request. Planning for a Kerala Houseboat Honeymoon? If you are enjoying a Honeymoon in a Kerala houseboat, ask for special arrangements like candle light dinner , flower arrangement etc so that you can enjoy your honeymoon with a romantic cruise.Also try to include other romantic destinations in Kerala like Munnar Hill Station , Thekkady Wildlife Experience, Marari Beach etc to ensure that you have a variety of experience in your honeymoon in Kerala. When you book a Kerala houseboat cruise for one night all meals will be served inside the boat and the Kerala Houseboat Menu is continental, south Indian, North Indian or traditional Kerala flavored with the local specialties; delicious local fish. Most f the houseboats cook food in sin flower oil even though Kerala is well known for coconut oil. You can confirm this in advance before getting on to the houseboat. When guests can check in at 12:00 hrs, they will be welcomed with fresh tender coconut water or juices.Once the house boat cruise starts the guests will relax and enjoy the canals and backwaters. Toddy can be bought from toddy shops on shore and it is a soft liquor made from Coconut it is safe pure and sweet. At around 13:00 hrs houseboats will stop for lunch either in the middle of the backwaters or at shore as per the request of the guest and a with lavish menu of traditional Kerala cuisine is served on board.The food is cooked inside the boat by a chef and guests can visit the kitchen to checkout the food preparation and the Kerala houseboat menu.Normally traditional kerala food is served with rice, sambar, vegetarian dishes, fish fry, pickles, papad , salads and sweets . The food is cooked from fresh and seasonal vegetables and fish and chicken are purchased just before the cruise starts. In case any of the guests are successful in catching some fish on board it will be cooked as well . Guests can also buy crab , fish or lobsters from shores and request the chef to cook the same on board for lunch or dinner in the houseboat and just imagine the taste of bug tiger prawns or lobsters cooked on the boat on your request. Houseboat crew will provide guests with evening coffee/ tea with traditional Kerala style snacks like Banana fry or Finger Chips or Tapioca Chips at around 16:30 and the boat will anchor on shore at 17:30. Kerala Government regulations does not allow boats to ply after 17:30 as fishing nets may get ruined by houseboat movement after this time.The boats will anchor on shore at 17:30 and guests can get a chance to go out and walk along the riverside or villages or go for canoeing by renting out a canoe and come back. When guests come back in the evening, they can enjoy the dinner in houseboat freshly cooked by the guest. Early morning at around 6:30 hrs Bed tea / Coffee will be provided sipping which you can enjoy the sunrise in backwaters. Before checking out breakfast will be served at around at 8:00 hrs which will include either the option of Bread+ butter + Jam + omelets or an option with South Indian food items like Upma, Puttu, Dosa, Idly with sambar and chutney as well as tea /coffee. If guests request the food items in the menu will be altered and food will be prepared according to their taste buds and preferences, and foreign guest can get food specially made with less spice or without spice at all. Most houseboats also have trained staff with valid licenses for cooking the food and serving it fresh and tasty giving importance to hygiene. 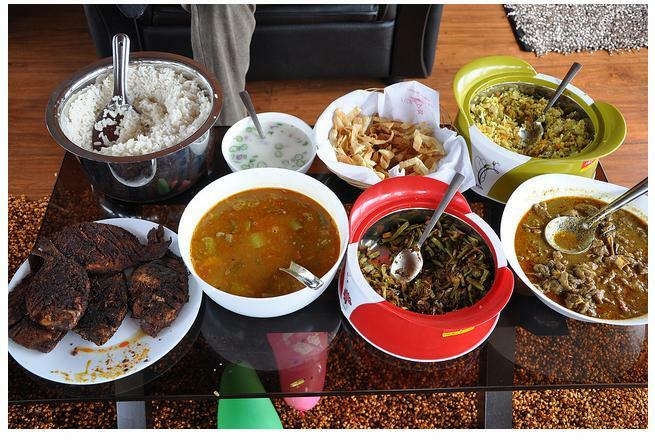 The usual menu in any houseboat will have the Kerala delicacies or North Indian and continental menu. Cochin International Airport is the nearest airport to Alleppey or Kumarakom backwater destinations at a distance of approximately 70 kilometers. You can prebook a taxi from Kochi International Airport pre paid counter or from your hotel in Kochi. If you are prebooking the houseboat, always try to ensure that you take a complete Kerala Houseboat package that includes pickup in a car from airport, hotel or railway stations, cruise in a hosueboat and drop back to airport, hotel or railway stations so as to save on money and budget. We recommend that you prebook a good houseboat with transportation to enjoy your trip to the maximum. About a week before it’s time for you to travel, make a list of all the things you need to take with you on your houseboat trip . Make sure you consider the weather forecast when you pick out your clothes. You will also need to take some kind of identity proof and make sure your travel documents are in order. Other things that can be taken with you are a mosquito repellent, a flashlight, sufficient cash and your phone. Just to be on the safe side, it is recommended that you take some basic precautions to ensure a trouble-free honeymoon. Don’t anchor your houseboat in very remote locations with no other people around. Pick a place where you’ll feel safe, and when you travel to unknown locations, go in your own car. Try not to travel after 7PM as the roads may get foggy, and should something happen to your vehicle, you will be left stranded.